THIS YEAR, IN THE CITY went down to the other end of the East Lancs Road and took over the recently-opened Holiday Inn Crowne Plaza, just next to the Pier Head. In The City is the UK's annual music industry convention. By day, in the hotel, it's a conference, with panels, events and presentations. In the evening, in the clubs and bars of the city centre, it's a pop festival with performances by new and unsigned bands, staggered so A&R people (Artist & Repertoire - the 'talent scouts' of the music industry) can get round and see as many acts as possible. The organisers of In The City are Tony Wilson and Yvette Livesey. The Manchester-based festival relocated here this year as it seemed a natural choice: Liverpool is legendary for music. In doing so they're overcoming old inter-city rivalries. I'm all in favour of this - Manchester and Liverpool should work together, especially in music. The In the City brochure quotes a long list of famous pop acts originating from the towns and cities on either side of the River Mersey, which starts in Greater Manchester and ends in the conurbation that takes its name, Merseyside. My aim this year was to soak up the atmosphere, learn about what's happening in the worlds of music and the Internet - increasingly one and the same thing - and take as many photos as possible. 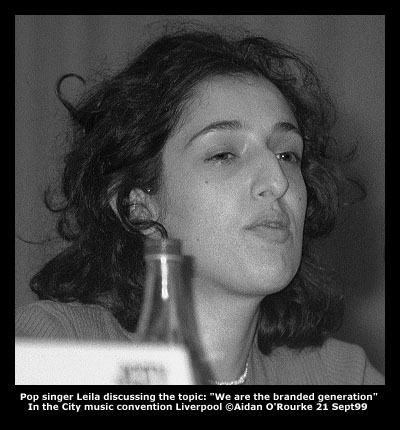 In four conference rooms, each named after Rolling Stones memgers, panels discussed various topics including "Are we the branded generation?" "Who needs a manager when you've got a lawyer" "Direct marketing gets more direct" and "Young, gifted and black - is it enough?". 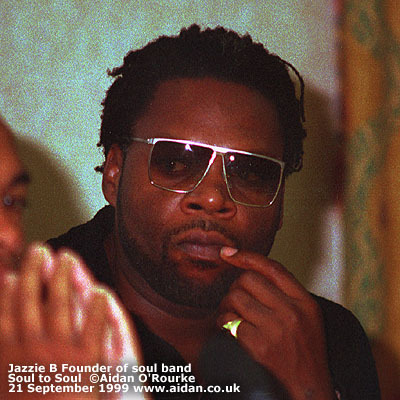 There were many distinguished panel members, including Soul to Soul founder Jazzie B, who had some definite views on the last question. The discussions were often heated, sometimes vapid, rambling and trendily peppered with swear words, but on the whole, I found the panels worth attending. They gave an insight into the often weird and wonderful minds of music industry people and provided an opportunity for delegates in the audience to voice their opinions. In The City is also about networking and making contacts or "schmoozing". One Liverpool-based manager of two as yet unsigned bands complained that the industry bigwigs are inaccessible and don't take the convention seriously, preferring to stay amongst themselves, getting seriously paralytic in the bar. But I'm sure that amongst all those people, new and useful contacts will have been forged, and who knows, a new mega-career may be in the making. 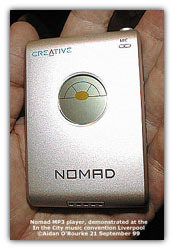 The talk of the week was the Nomad MP3 player. If you don't already know, MP3 is an internet file format enabling you to record and play music at CD quality, but using a fraction of the file size of previous formats. You can download music from MP3 sites and play it back on your computer. Transfer them to your MP3 player and you can listen to music while you're out and about. Like a personal stereo, it's small and comes with a pair of headphones, but unlike a Walkman, it has no moving parts. The data is read from a flash memory card similar to the one I use in my digital camera. I had a listen - the sound quality is extremely good - and there's no wow and flutter when you shake the machine. 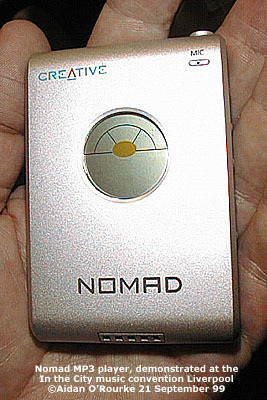 The Nomad will be going on sale shortly, and I'm told it will retail for around £160. But the big question facing the music industry is: If people are downloading, copying and even selling copyright material, how will the music industry stop illegal copying, and make sure that artists are rewarded for their work and creativity? There are no clear answers yet, but it looks like a new globally enforced copyright law will have to be developed. The technology isn't waiting for the legislators though. Soon it will be commonplace to pay for and download individual tracks - Per track prices may be well under a pound. Tony Wilson's already preparing to embrace the MP3 revolution with the new site www.music33.com which will be going live soon. David Bowie is also pre-releasing his latest album on the Internet. I think it's a great idea, as I tend to go for songs rather than artists, and I've always wanted to make up my own compilations. 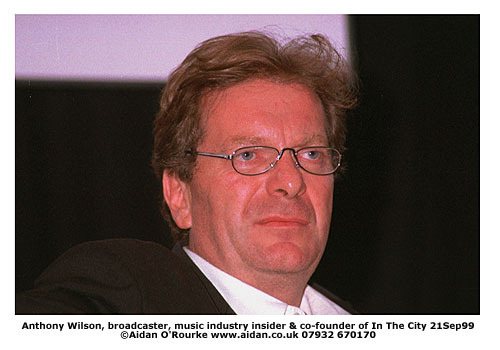 MY PERSONAL HIGHLIGHTS of In The City 99 were the celebrity interviews ably conducted by Tony Wilson. 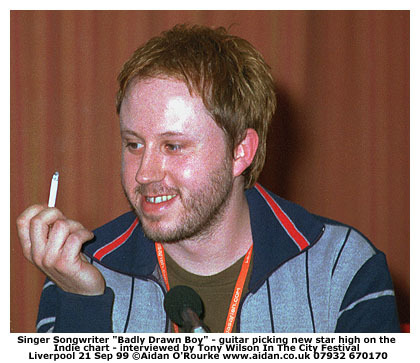 On Monday at 5.30pm Mike Pickering, Bert Yansch and indie newcomer Badly Drawn Boy talked about songwriting. 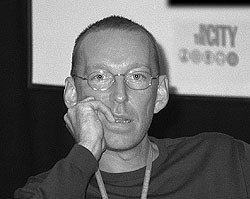 Mike Pickering, by the way, is driving force behind M People, writer of many hits including "Search for a Hero" and "One Night in Heaven". 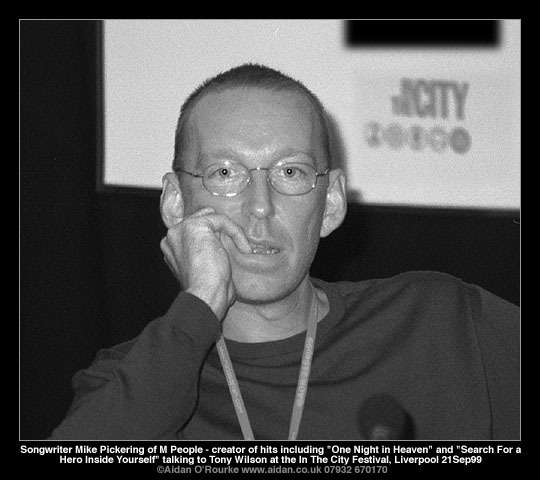 One of the most insightful moments of the festival was his reply to Tony Wilson's question: "Where do songs come from? How do they come about?". "I don't know" was Mike's reply. Tuesday belonged to ex Frankie Goes to Hollywood lead singer Hollie Johnson - one of the most famous and controversial stars of the 1980's and for many the pop face of Liverpool. When he arrived, the security guard apparently didn't recognise him - everyone - even Tony Wilson - has to show their delegate pass to gain entry. Later, in conversation with Tony, he remembered his pre-pop star years, aided by old friends in the audience. 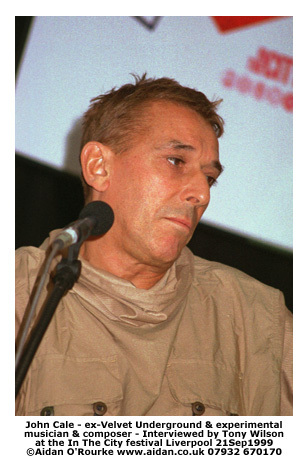 Despite being diagnosed with HIV in 91, he's still very much with us - His stories and insights were fascinating and at times hilarious, delivered in a clipped, camp and eloquent Liverpudlian accent. - The audience of delegates gave him a warm round of applause at the end. 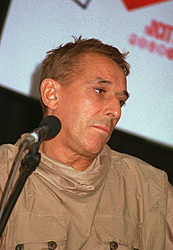 Later there was an extra interview with John Cale - the weird, creative, erudite and experimental co-founder of seminal New York band, the Velvet Underground, and close associate of legendary singer songwriter Lou Reed. "I spoke to Lou before I left New York" he said. It's amazing to see legendary artists I knew and listened to 25 years ago sitting there in front of you. He had to leave early as he was flying to London. Later I went to the closing night party for a quick sample of some of this year's unsigned bands. 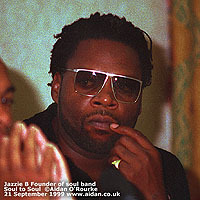 It was held at the Life Bar, the trendy cafe-bar music venue now occupying the Lyceum on Bold St. The building is impressive from the outside, but inside, the space was cramped. 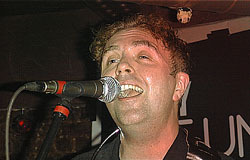 Downstairs I saw Ian McNabb, formerly of 80's hit band The Icicle Works. He sang mostly 'unplugged', accompanying himself on acoustic guitar. He gave a version of Icicle Works 80's hit: "Love is full of beautiful colours" using reverb electric guitar - at times using it as a percussion instrument. Fantastic. 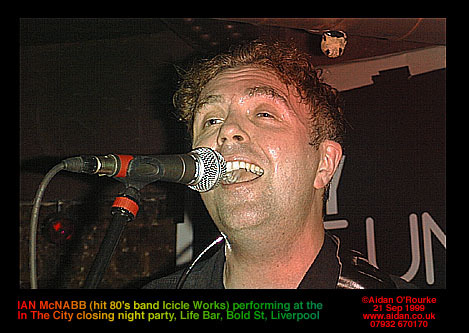 A guy in the crowd told me Ian is highly regarded in Liverpool and does a lot for local bands. This person also recommended a band called Man Made Superbugs, who played yesterday. I said I'd pass this on - and if they get famous, remember, you read it first on Eyewitness in Liverpool. 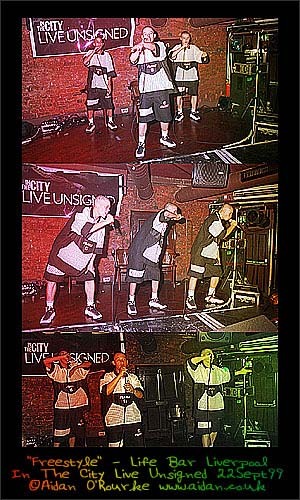 The evening continued with Black Unsigned acts I Kane and Freestyle - an unpromising-looking trio of pale-skinned, shaven-headed youths, all dressed in matching outfits. Appearances deceive - they were brilliant, delivering a loud and punchy dose of black American-sounding rap, complete with synchronised arm, head and leg movements. I wish I could understand what they were saying, though! 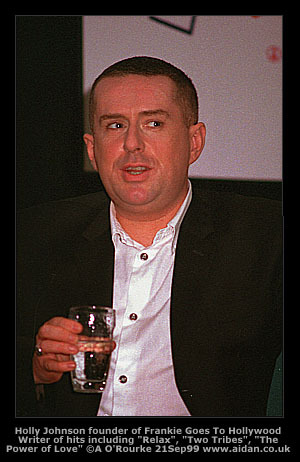 But it was time for me to get up to Lime St station for my train back to Manchester - Outside the club, a long queue of people waited to get in, and there, just near the entrance, was Holly Johnson chatting to friends. I wonder which of the young unsigned acts that played at In The City 99 will be the Holly Johnsons and Mike Pickerings of the future? Watch out over the next few years - Tony Wilson reckons another pop revolution is just around the corner.